Background:This election takes place as the War Hawks in Congress inevitably push James Madison to war against the British.While the nation has a cause for war, the military is not much more prepared than it was during the Revolution. However, militant optimists expect a resounding victory, including the potential annexation of Canada. This leads to another disagreement. Pro-war Northerners are wishing for Canada to become a new state, while Pro-war Southerners fear that a Canadian state will greatly diminish the influence of the South.Therefore, Southern politicians hope to use Canada only as a bargaining chip in a peace treaty. Support for the war is minimal in the North, as trade is heavily dependent on British cooperation.After having endured Jefferson’s embargo,and having to deal with a continued embargo with Madison,a war with a European power would certainly wreck their economy. Overall, Madison’s reelection isn’t guaranteed, as it had been for Jefferson. For two years, Madison was aimless, and ultimately appeared to continue Jefferson’s less popular policies, such as creating his own embargo. Madison also killed the National Bank,which worried some of the major cities. 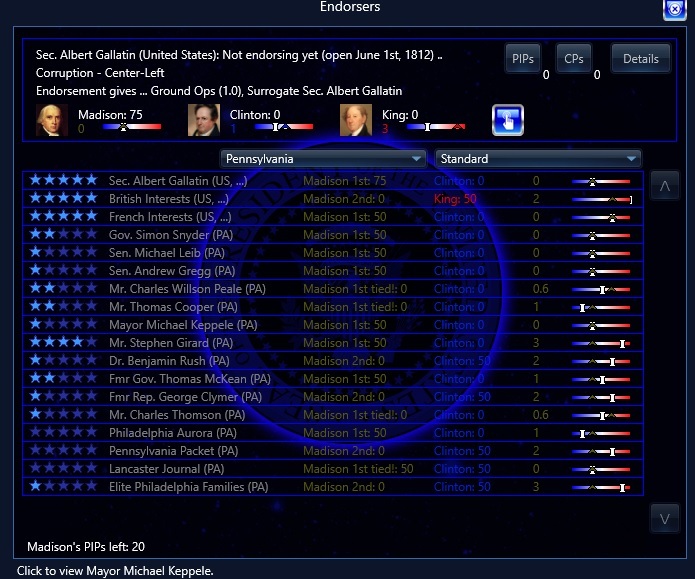 With Madison’s reelection in question, the opposition felt a chance for victory. However, the Federalists were so disorganized on the National-level following recent defeats, that most of them would accept a moderate Republican, such as DeWitt Clinton, who favors many Federalist policies,such as Federally-funded internal improvement. Some Federalists, like Rufus King, who to build a straight Federalist ticket. The election was fairly close, but Clinton was unable to pick up the crucial state of Pennsylvania, which he needed to win the election. Had Clinton selected a Republican Pennsylvania running mate, rather than a Federalist Pennsylvania running mate, he might have won the election, even if he lost some Federalist support. Surprisingly, Madison won Vermont, despite Northern opposition to the war. Madison had solid support in the South and West. 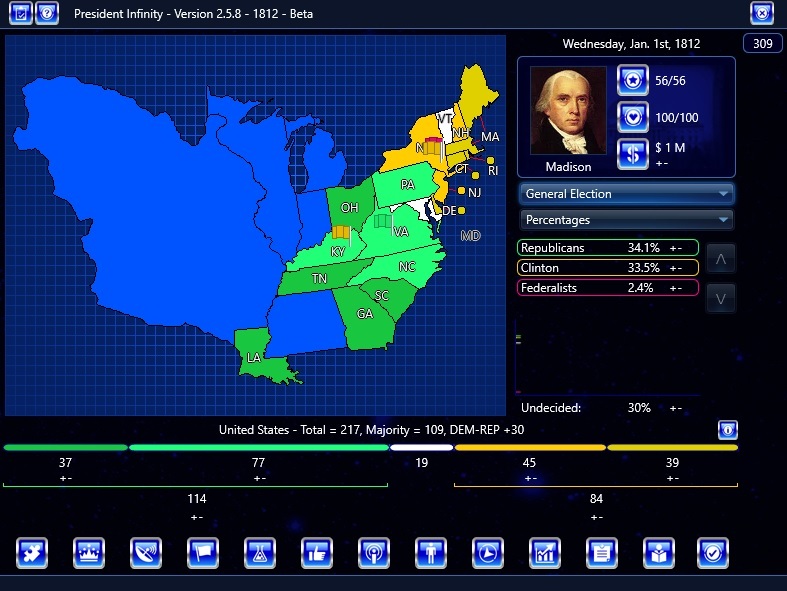 Madison was able to win reelection despite several military setbacks during the war. Pres. James Madison, the incumbent running for reelection.